Cambridge Half Marathon – I’m in it! A man contemplates his punting pole! He was happily punting, albeit with a complete absence of skill, when his pole got stuck in the mud. He decided not to let go, the punt continued on its way and he fell in. I came late to this minor human tragedy. He had already hauled himself out of the unforgiving river Cam and I caught him considering his next move. Or the refraction of light. I haven’t been running much lately but now I’m picking it up again. 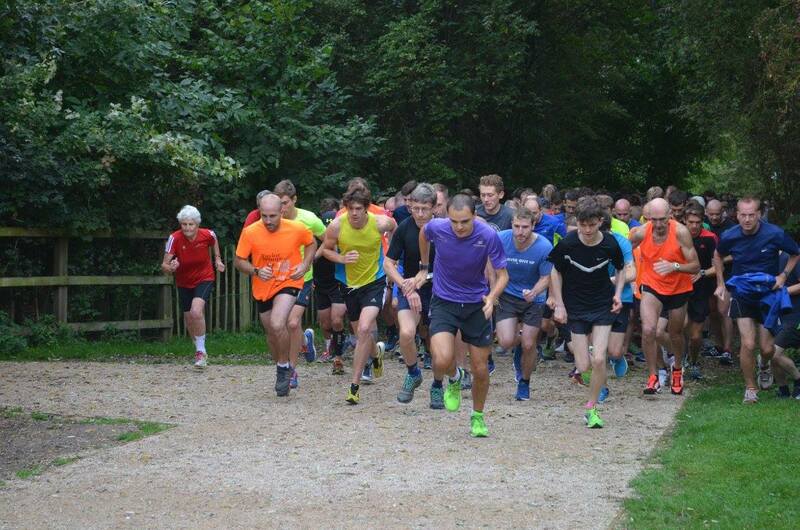 I took this pic at Cambridge parkrun in mid September during my running pause. Chris is leading at the off and comes in first. Far left in the red top is Mary who is in the 80-84 age range and invariably completes the 5k in 28-29 minutes. I’m in the Cambridge half marathon, along with my son Dan. There’s a field of 9000 for 2017 and it’s at the beginning of March . I’ve got five months to train up so I’m spoilt for time. Last year I managed to get food poisoning the day before the Cambridge half and missed it. I don’t think I had ever felt more ill in my entire life. I’ll forgo the Tesco cheese cake this time around. Anyone heard of the British Gut Project? We’re thinking of signing up and sending them a poo sample. They will analyse your microbiome, that is, examine the profile of your gut bacteria. There is currently more focus on gut bacteria and its relationship with illness, weight gain, mood and inflammation. The British Gut Project is scientific research which is crowd funded so you pay them to accept your poo. It’s very expensive compared with flushing it away but more fun and more informative. It’s also a novel Christmas present and an excellent talking point at the family dinner table. In the interest of increasing the diversity of my gut bacteria I’ve started eating mouldy blue veined cheese as recommended, or possibly suggested, in Tim Spector’s The Diet Myth : The Real Science Behind What We Eat. I’m so suggestible! He leads theBritish Gut Project at King’s College London and has got 5000 twins on his books. That’s a lot of twins!